This credenza consists of a well figured burr walnut veneered top with a moulded edge and rounded corners. This leads down to an ormolu moulding with a shaped frieze below with inlaid decoration of burr walnut, amboyna and various other woods. 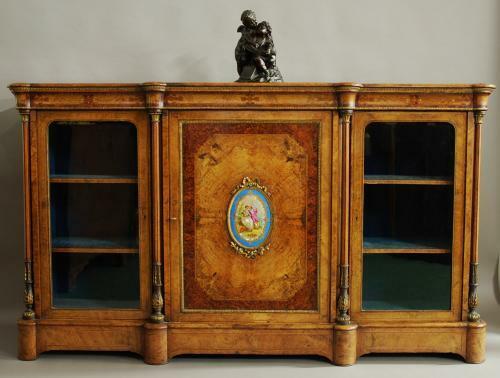 The credenza has three doors, the central door is crossbanded with boxwood stringing with an ormolu moulding. The outer border is of amboyna with in inner panel of quarter veneered burr walnut with inlaid decoration to the corners and a decorative central painted porcelain oval plaque. This porcelain plaque depicts a couple relaxing in the countryside and is in very good condition with ormolu ribbon embellishments to the top and bottom. The interior has two shelves that are lined in blue velvet fabric at present. To either side of the central door are two turned columns, veneered in walnut and amboyna giving the appearance of fluted columns. There are also two more identical columns to the sides of the outer doors, all four columns having decorative ormolu mounts to the top and bottom. The doors to either side of he central door have glazed panels with rounded glass to the top with a brass ball bead moulding, the interior again having two shelves lined in blue velvet fabric. The piece is supported by a shaped plinth of figured walnut veneer with inlaid decoration, the side panels also being of figured walnut veneer. This piece is of stable construction, it is in very good condition and can go straight into a home.